I recently picked up a very nice set of OLA's from the original owner. They are the Walnut cabinets and on opening them up I found they have 16/16/3 in the crossover (Rev 1 I think). One of the woofers needed a refoam and while the cabinets are in great condition there is some scratches on the bottom. I'm guessing over the years they might have been pushed around a little bit. I got the history and they had been refoamed before. I ordered a set of replacement surrounds from Rick Cobb. They were missing the badges and I ordered those from Kent. (Thanks Kent!). The original owner recovered the grills, but I think I can do better. I am considering getting some Irish linen from Michaels and re-doing the grills. I am also planning on a recap. My question is, "Should I be moving to the Rev 2 crossover? Any comments on Rev 1 vs. Rev 2? I found the diagrams that Pete did and I've read some of the posts. I'm not really clear on the sonic differences between the revisions. Presumably the Rev 2 was an improvement and I'm sure Pete recommended doing Rev 2 when I did mine. I would also suggest adding cabinet braces and replacing the foam blocks with fiberglass stuffing. I never A/B'd the sound of Rev 1/2 and truth be told I was underwhelmed by the OLAs when compared to my (then) AR-2ax's, so I sold the OLAs. Thanks Kent. I like the way you spread them out. I am thinking that they will have less coupling that way. That inductor you put on the woofer/low pass is serious gauge and serious money. The price right now is lower but it's still $33 ea. Any reason why you went all the way to 14 gauge? I was thinking that 18 gauge would be enough for a woofer as long as the DCR was not above what they had stock. PE specs say " Power Handling: 800 watts" and 0.28 DCR. PE have an 18 gauge 1.5mH with power handling of 300 watts that has a DCR of 0.64 ohms and costs just under $9. The DCR is higher than the Rev 2 diagram which has 0.28 ohm. Is that why? Ok. Just re-foamed the one masonite woofer that needed it. Didn't use the 30Hz disk that came with it. It was easier to just go to the internet and find a 30 Hz file and play it through my receiver via my iphone. Fingers crossed that it works good after fully drying but it wasn't rubbing when I left it. I was really concerned that I might not be able to do this, but it wasn't too difficult. I'll be inspecting the other woofer to see if the surround is showing any aging. If it does I'll replace the surround with the other one that came in the kit. I also recovered both grills with the Tea colored Irish Linen from Michaels. I used the 40% off coupon available on the internet. Cost was around $12 after discount for both speakers. Next up would be to address the crossover and the scratches on the bottom. The rest of the cabinets are in good shape. Does anyone have any recommendation as to what treatment to do for the veneer? Linseed Oil maybe? yes, IIRC it was because of the DCR but Pete's really the go to guy on this. Speaking of Pete, he said laminated steel core would be good for the woofer, and I think less expensive. I had thought these were "keepers" and so didn't mind the extra cost but things change. Does anyone have any recommendation as to what treatment to do for the veneer? Linseed Oil maybe? If the cabs are in generally good shape you could use Howard Restor-a-Finish, then the next day use Watco Danish Oil. 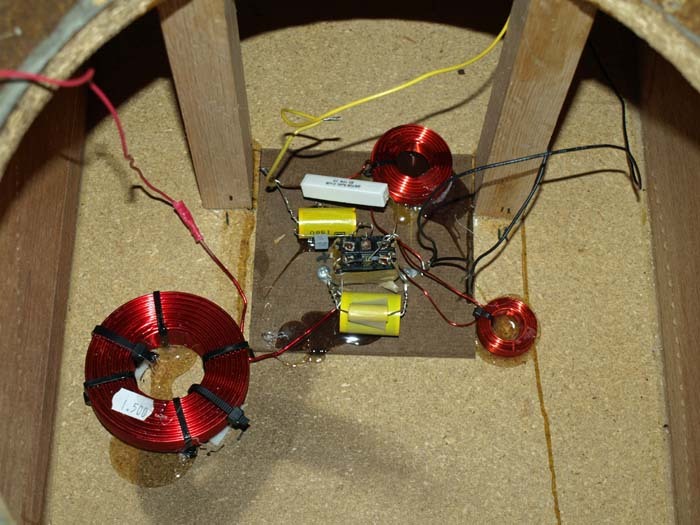 Well, darned if I didn't find one of Pete's old posts from AK that talks about the inductor recommendation for 14 gauge. He also talks about spreading out the inductors too. I'm enjoying the journey on these and can't wait to hear them. I have never heard what an Original Large Advent sounds like. Second picture should have the 3 ohm across the 8 uF cap. Zalytron, but obviously there are many choices. the ESR of the original NPE cap. I do this in my rebuilds. Keep the inductors a good distance from one another to minimize field coupling. So I have put them together with the refoamed woofer and the updated grills (with new badges) and I'm listening to them. I'm underwhelmed. Of course I'm comparing them to my early KLH Sixes that have been totally restored and recapped. They just don't strike me as being as musical. Now I definitely have to recap these to see if it makes a difference. The tweeters all work and I've tried all 3 settings. The extended setting is a little too bright for my tastes - even with the original caps in place. The Normal and Decrease settings are better, but still not very musical. They aren't bad - just that my Sixes just seem to be so much more enjoyable. Am I biased? Ok. Biting the bullet and rebuilding the whole cross-over to the Rev 2 specs. Some of the DCR's are off from Pete's diagram on what I selected, but I hope it doesn't hurt too much. Total damage was about $66 shipped. I'll let you know if it sounds any better after installation.... While I wait for them to arrive I'll work on the cabinets and deoxit the switches. That's the easy part. I also have the OLA and the tweeters sound harsh when pushed even a modest amount. Over the last 15 years or so, I've heard a few pair and they all have that same steely edge. I didn't notice it back in the day. They used 70's receivers and vinyl in those listening rooms at Sam Goody's, Heathkit and other 'stereo' outlets of which the names escape me at the moment. Maybe today's equipment is too revealing or maybe they knew what they were doing and we are not feeding the OLAs properly. Could you please post a photo of the finished Xover? I have no problem with me re-doing mine (again) if it's worth the effort. AIl I did was replaced the caps with similar values. Sure stan461, I'll take some pics. Just started tonight. Took some windings off a pair of the 0.1mH inductors to get them closer to the 0.065mH in the Rev 2 crossover. Opened the cabinets and took some "before" pics. Just about ready to do the real work. I suspect they'll look like Kents crossovers when I'm done. Ok. Started replacing the inductors and saw something in the Rev 1 diagram (from Pete's site. Sorry Pete) that wasn't right in comparison to both of my cross-overs. The C1 on my units are in a completely different location. I'm seeing C1 tied directly to the "+" terminal on the backplate and so is L2. In fact on Pete's site I can see where he has pictures that might be similar. I just can't quite see the connection of C1 to that "+" terminal in his pics, but.... I can see that the C1 and L2 join together with a jumper from the top to bottom of S1. Which would support how mine are connected. I will try to edit the diagram to show what I think is the circuit for my OLA Rev 1's. So far as I can tell it is only that C1 is in the wrong place. See where I circled the connection where C1 tied directly to the "+" terminal on the backplate and so is L2. Here is where I think that C1 should go. Let me know what you think. I'm looking up at post 4 by Kent and his picture might be the same, but it isn't clear enough to me to be sure. EDIT: Once I heard back from Pete, I agree with him that electrically the position of C1 can be in either the old or new location and it will work the same for all 3 switch positions. The only small caveat is where someone might be using the diagram for wiring the crossover per original constructions. I was thinking, when I saw your post, "maybe THAT'S why I didn't love the Advents". But I looked at my photos and indeed I did wire C1 directly to the + terminal, so it's like your revised schematic. I wonder if that means that both the Rev 1 and Rev 2 diagrams have the same error? I'm trying to move from Rev 1 to Rev 2, so I want to confirm before I make the change. BTW, I'm not loving the Advents either. I'm spoiled with my KLH Sixes. That's why I'm trying to do a refurb on them to see if a crossover refresh and an upgrade of the crossover Rev level will help. The cabinets are to die for though and gosh these things are heavy. I did rev 2 and the C1 is wired as you show. Thanks Kent. That's all I needed to proceed. I'll continue tomorrow. BTW, your OLA is missing its badge. I just picked up a set I can loan you! Got the crossovers rebuilt and listening to them now. I didn't mortite them yet as I wasn't sure if I'd have to re-open them. They sound ok and might be sounding better now. It's going to take some time and I'll have to compare them with my reference set (my KLH Sixes) to see if they sound better than before. I don't know if Pete is around, but do you think he might give an opinion on the schematic change? I was wondering if he'd mind if I did the Rev 2 diagram change as well assuming the change passes his QC. I'm not the first one to find that C1 was not in the right place. This is mentioned in the following thread from 2009. Pete even responds to the find in this thread in post #14. Pete did a dynamite job of drawing up those diagrams. I am really grateful for his hard work on them. I'm hoping that Pete will pop in and comment. Here is the Rev 2 with the same change.